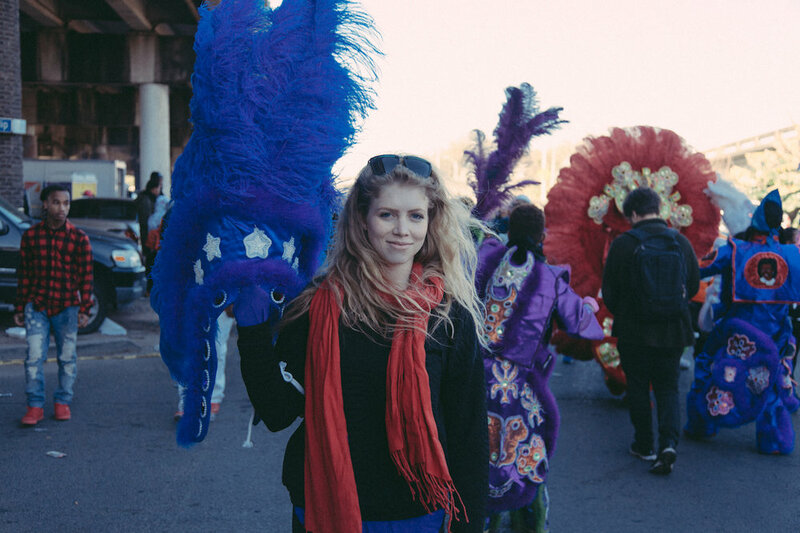 Nicole Hershey, originally from Saint Louis, is now rooted in many of New Orleans’ storied traditions like Mardi Gras Indians tribes, second lines, and an overall reverence for the creative spirit. Every wall and corner shares a glimpse of artwork that inspires her to feel a little more deeply. Her home is “never finished,” but it’s always a relief and comfort for her and her adorable dog, Fetty Pup. People don't know that I work very closely with a youth Mardi Gras Indian tribe. I sew with them every season, and I help with fundraising. I met the family through a church I infrequently attend, that supports them. Most people know that I sew with them, but they don’t know that I’m deeply involved with the family. They’re kinda of my second New Orleans family, and they live right around the corner! 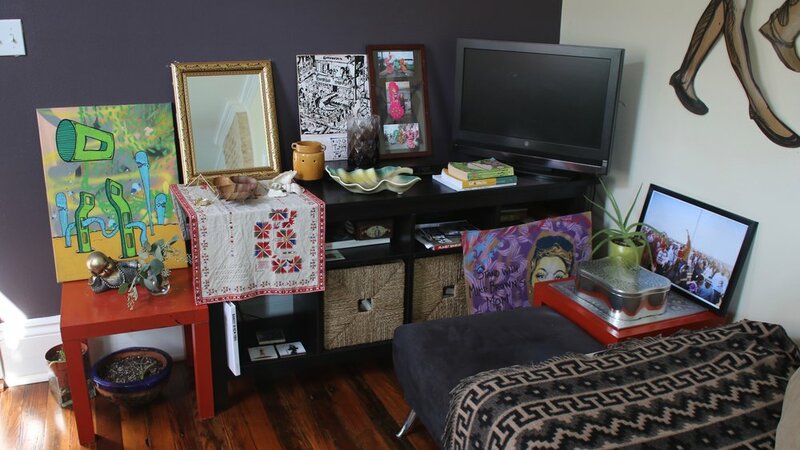 What’s your favorite piece in your home and why? My most special piece is probably [points to painting] this framed watercolor because my grandma painted it. She painted watercolors for years and years and she painted this from a photo my dad took while my parents were living in the Ivory Coast of Africa. She’s got folders and folders of watercolors in her house, and she lets me steal them now and then. She let me steal that one and so got a nice frame for it. How did you decide on this photography for your custom pillow? I do a lot of work in the local art environment, and I knew that I wanted something from a local artist. Most of the art in my house is local art or art I picked up during my travels, and I wanted to highlight that. I thought about a couple of people, but this design is a photograph from a female photographer, Ashley Lorraine, who captures series of portraits and landscapes. This photo is from a color treated landscape that I have framed in my bedroom. 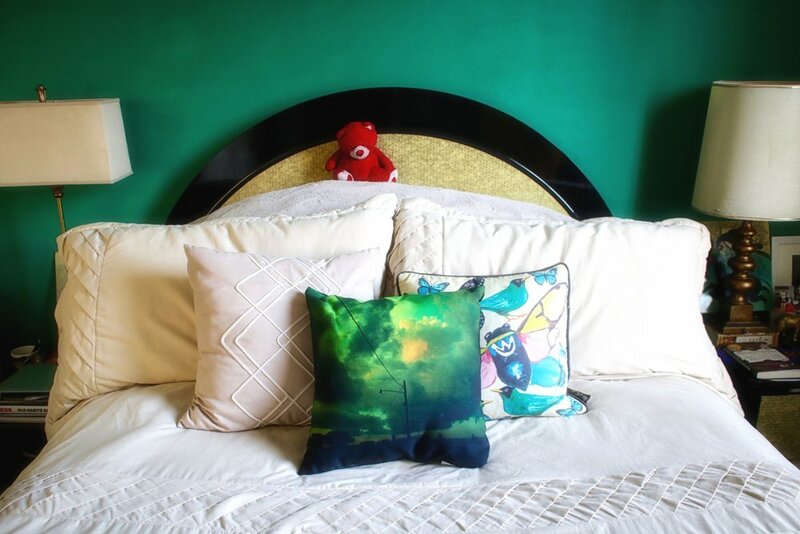 The wall behind my bed is green, so I thought it would look really cool as a pillow and would add something unique to my space. Ashley was happy to oblige for me to use it. I love to support female artists, so it means a lot in many ways. I work for Eiffel Society, a special events venue, and lounge, and I manage private event sales. Everything from booking to planning corporate events, weddings, fundraisers, and baby showers. We also offer catering and bar service, so there’s a lot goes into selling and planning. That’s my primary job. For fun, I am very much involved in the art scene. I organize art pop-up shows, I co-curated an exhibit at the Ogden Museum of Southern art and the Engine Room, a contemporary art space, both focused on graffiti art, and I serve on young professional committees for two art institutions in town. At home I read a lot, I’m currently reading Their Eyes Were Watching God, I enjoy cooking and host dinner parties and game nights. I also practice acro yoga. You walk in the door after a long day, what’s the first feeling that comes to mind? Relief and comfort. I’m very busy and active by choice. I’m constantly running around to different activities, when I come home I feel relieved, I’m comfortable, and I can unload. I don’t have to worry about the dog [Fetty Pup] running around. He goes with me a lot of places, so it’s nice when he’s comfortable at home too. Even when I invite people into my home for dinners and things, we’re all friends - people who are very comfortable with each other and I like to make a setting that’s comforting for others. Tell us about this amazing piece of art behind you. 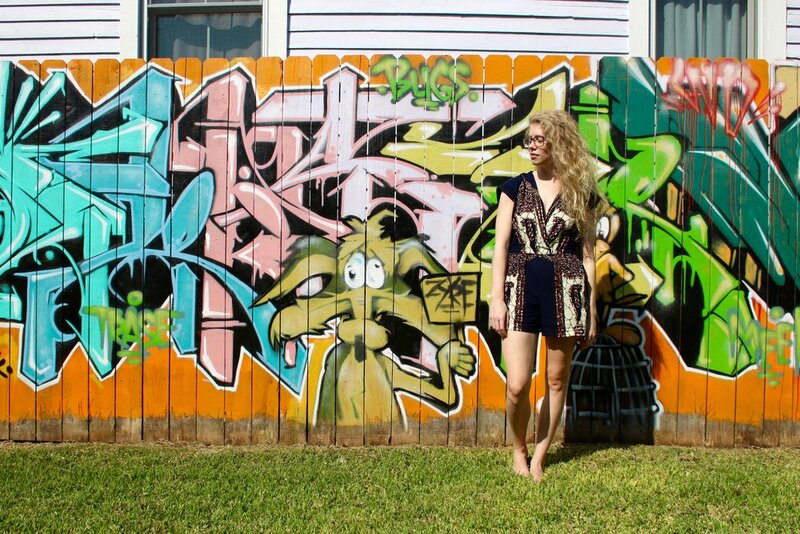 The piece behind me was created by Henry Lipkis, a graffiti and street artist, who’s made New Orleans his home for several years now. This piece was done for a show at The Zeitgeist, each of the individuals is a separate piece. Gosh, there must be at 20 of them total to represent a whole second line, all of the figures are people he’s photographed or imagined or seen at a second line. Describe a second line for those who aren’t familiar? There are many definitions...basically, a second line is a street party organized by neighborhood-based social clubs with a band that follows for several miles. People come out to dance with the members and the band. Each club has anniversary second line the same Sunday every year. The groups have new outfits every year, with fans with club name on them. Why is art so important to you? I grew up getting dragged to art museums, so I guess it was implanted in me young. Now that I’ve gotten older I find that it brings a lot of curiosity out in me and makes me feel emotions differently, it could be something funny, puzzling interesting, sad, beautiful, whatever it might be. I’ve learned you don’t have to have formal art education to appreciate and enjoy art, especially local art. It’s really impactful because it comes from the community that you’re in, it’s a form of expression for people, who many times, don’t have a voice another way and that’s how they express themselves. It’s a very honest way of showing someone who you are, through art you make. As someone who enjoys art but doesn’t make it, I really respect people who can do that. And I just enjoy art and being surrounded by artists because they give a real sense of connection and it’s just fun. The people who are in the art community tend to be a little quirky and fun, super interesting, and very friendly - who also appreciate beautiful and fun things.